If your nonprofit uses Google Analytics to track your website’s performance and visitor behavior, you most likely received this message. We recently sent an email introducing new data retention controls that allow you to manage how long your user and event data are stored by Google Analytics. We would like to remind you that the new data retention settings will soon take effect – on May 25, 2018. If you haven’t already done so, please review and confirm these settings (Property ➝ Tracking Info ➝ Data Retention) as Google Analytics will begin to delete data according to these settings starting May 25. Any user and event data that is older than your retention setting will be marked for permanent deletion, and will no longer be accessible in Google Analytics. Deletion will affect the use of segmentation, some custom reports and secondary dimensions when applied in date ranges older than your retention setting. 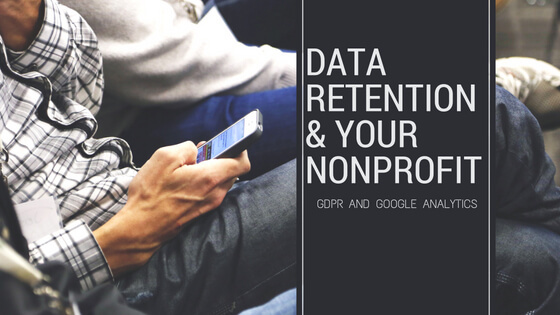 Find out more – You can also learn more about these data retention settings or how Google Analytics is committed to safeguarding your data. You’ve probably also noticed this the last time you logged into Google Analytics. In short, here’s what your nonprofit should consider. In order to comply with GDPR, Google is going to delete specific analytics user data after a new default period of 26 months. GDPR states that data are only to be stored for as long as necessary for analysis and then deleted. Some nonprofits rely on specific Ad Hoc reporting features and detailed segmentation of web traffic analysis older than 26 months. If you have customized reporting in place, you may want to adjust the Google Analytics default. You can change this setting by logging into GA and going to Admin > Property Settings > Tracking info > Data Retention. It will look like this. If your nonprofit organization needs help with Google Analytics, contact us at ArcStone. We’re Google Partners and we’re happy to help you with your marketing and web needs.